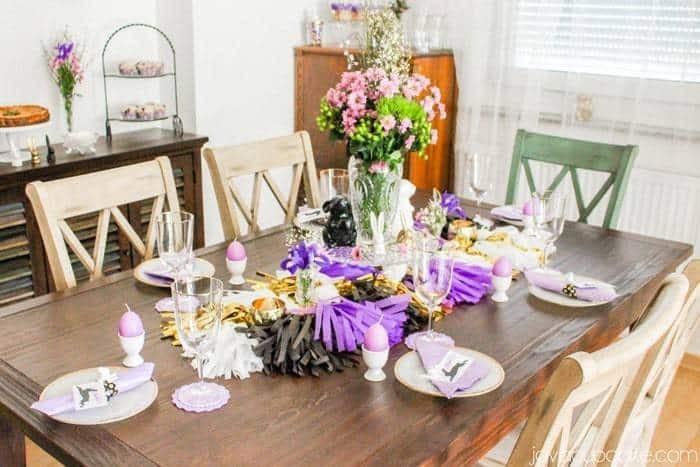 Creating a Glam Easter Brunch and Tablescape on a Budget shouldn’t be difficult… it should be fun! This DIY tutorial includes both food & decor ideas to host a glamorous yet thrifty brunch your guests will be impressed with! I’m so excited to be presenting you this two part series on how to create a Glam Easter Brunch and Tablescape with Rachel of MyDIY.life. Rachel and I have done several blogging collaborations in the past, but this one is by far my favorite! In this series, we’ll show you how we planned, shopped for, baked and set up our Easter Brunch. And the best part… it was all done on a budget! If you’re starting here on my blog I’ll be going over everything food related. I’ll show you how I planned my menu, what’s on the menu to and how I made it and how I styled the food on the tablescape. On MyDIY.life, Rachel will go over all the details of the tablescape. She’ll cover the place settings, the printables, the centerpiece and flower arrangements and everything in between. Before I could bake anything for brunch, I had to decide what I wanted to make. For our Easter Brunch, I knew I wanted to serve food that could be easy to plate and served buffet style and made ahead of time. I didn’t want to be rushing around Easter morning trying to cook and bake after getting home from church. For the main dish, I chose to make a quiche. A quiche is a great choice for a brunch because it can be made ahead of time and served cold or room temperature. This Southwestern Fajita Quiche is a take on one of my families favorite flavors… Mexican. I seriously think we eat something with bell peppers and onions it at least twice a week so making a fajita quiche was too easy of a decision to make. 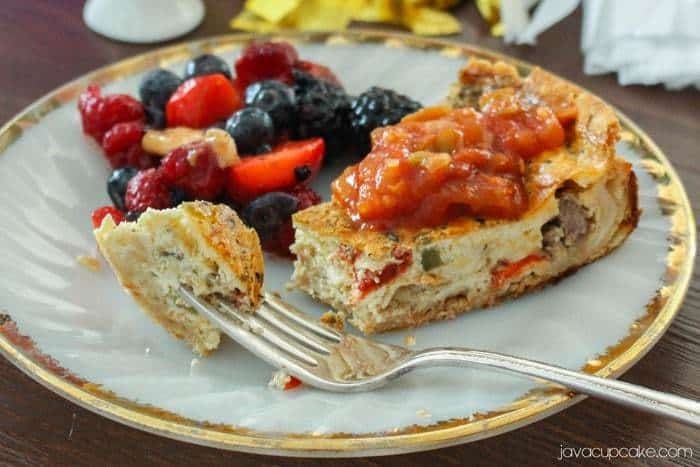 My Southwestern Fajita Quiche is made using a premade pie crust then filled with whipped eggs and cream, bell peppers, onions, steak and the perfect mix of seasonings. I served it with a sides of sour cream and salsa, but you could serve chives, cilantro, diced tomatoes too. Just put out whatever your family likes. 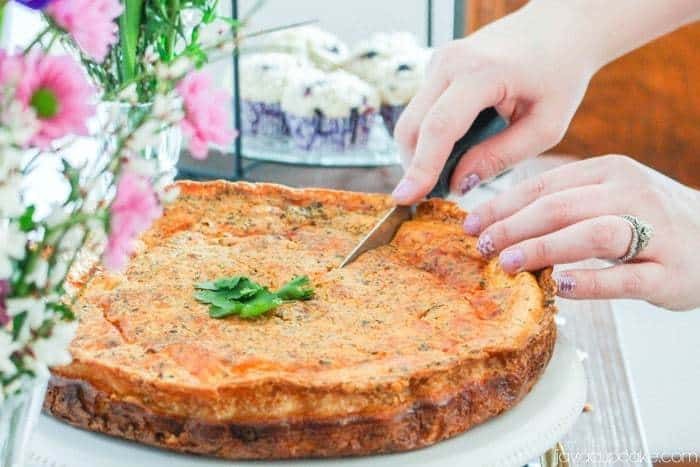 This quiche is filling, flavorful and so incredibly delicious. It truly is the best main dish for a brunch! I love fruit salad, but I’m picky about the fruit that I include it. Berries and bananas are my go-to favorite fruits for salads. But, since this dish is for our Easter Brunch, I knew that it couldn’t be boring. To amp things up for this fruit salad, I added the juice of a lemon, honey, cinnamon and a dash of nutmeg. All those flavors together really brings a simple fruit salad to the next level! 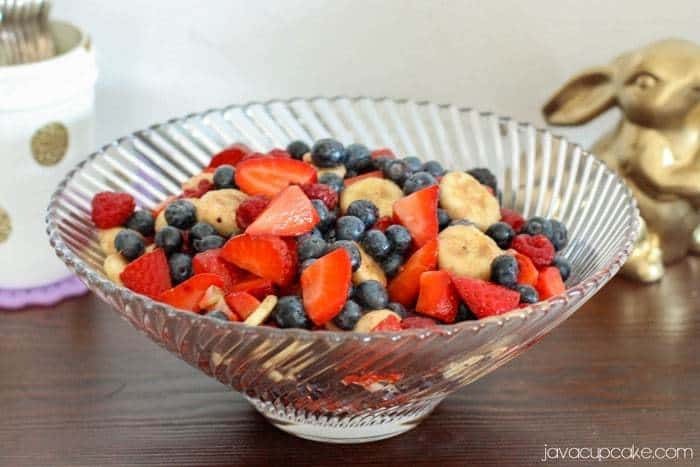 In a large bowl, gently toss together the berries and banana together. Pour the juice of 1 lemon over the fruit and toss. Drizzle a generous amount of honey over the top of the fruit then sprinkle cinnamon and a dash of nutmeg to taste. To accompany the quiche and fruit salad, I decided I want to add a bread element to the menu. 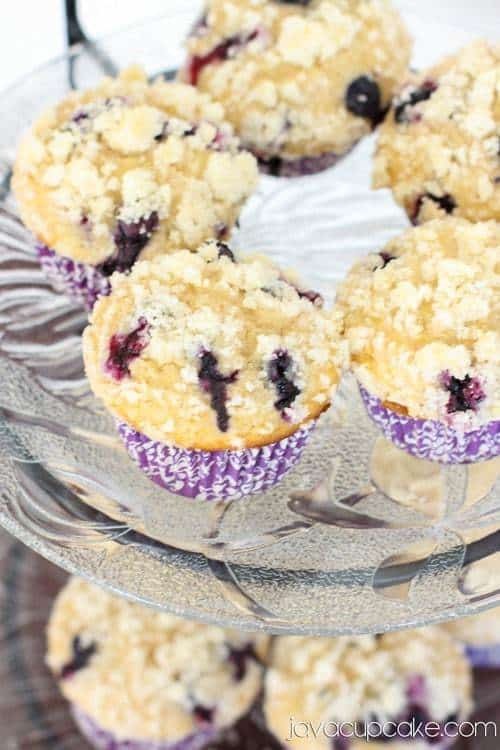 I decided on my Jumbo Blueberry Muffins and added a simple strudel topping. The juicy blueberries pop out of this muffin making this the perfect side to the quiche! And, you can make them ahead too! I baked these muffins in grease proof liners from Sweets & Treats Boutique. STB is an awesome party supply company because they offer several products in matching colors and patterns! Because Easter wouldn’t be complete with out a bunch of kids running around, I created a little something extra to make our little ones happy! 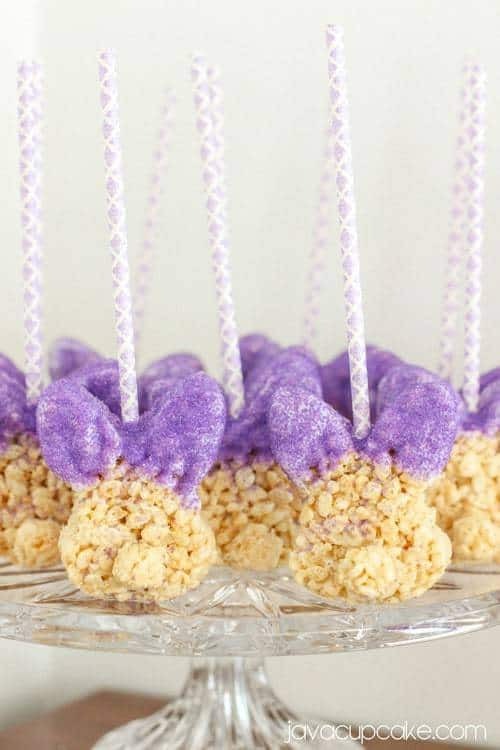 Hand dipped Rice Krispie Treat Bunny Pops! 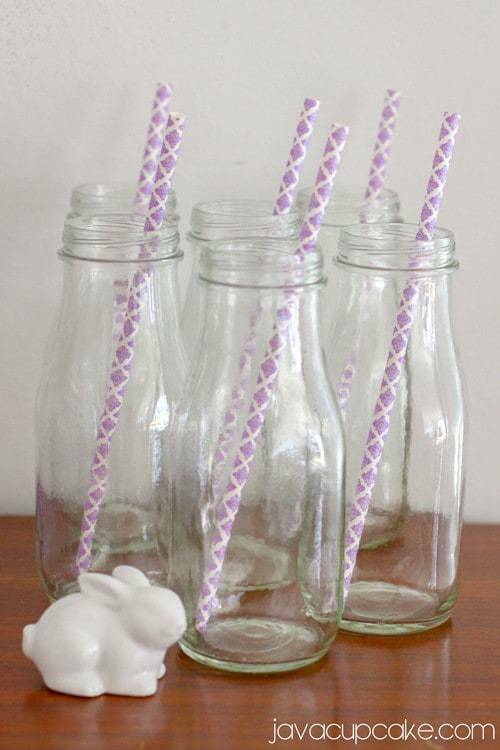 These bunnies are so incredibly easy to make! I used the same technique to make them that I did when making the krispie pops for Matty’s Minion party. Cut out Rice Krispy Treats using the bunny cookie cutter. Using leftover scraps make small balls for the bunny tails. Press the bunny onto the table so it stands up straight. Do this before you dip. Melt the candy melts as directed on the packaging. Add a drop or two of coloring and mix until uniform in color. Dip the ears of the bunny in the melted candy, tap the bunny on the edge of the bowl so the excess drips off. Immediately cover in purple sugar crystals. Set it standing up on a piece of wax paper. Dip a straw into the melted candy about an inch then press it into the top of the bunny between the ears. Allow them to dry completely before moving. Creating the tablescape for the dining table along with the displays for the sideboards was a lot of fun! Rachel and I had ideas in our minds of how we wanted things to look, but it was a matter of finding everything we needed at the stores here in Germany without spending a fortune. Each place setting included a plate and glass, both of which were gold rimmed that Rachel already had. 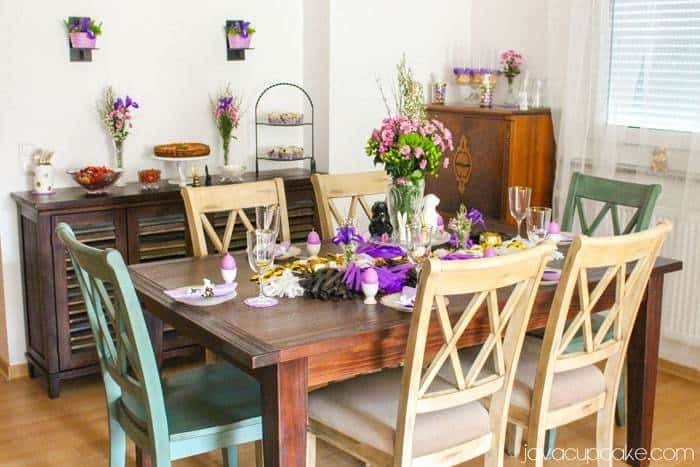 We purchased lavender napkins and coasters at the Euro store along with egg cups and purple easter egg candles. On top of each plate is a DIY name card which which you can find a full tutorial for on MyDIY.life! You’re going to love how Rachel created the name cards & used elastic to tie it all together! Fresh flowers are the main focal point for our entire tablescape for both the main dining table and the sideboards. Rachel went to the local market and picked out all the lavender colored flowers along with a few accents she thought would go well together. Rachel goes into all the details of the floral arrangements on MyDIY.life. On trend right now are DIY tissue paper tassel garlands. Rachel and I both have one hanging in our office which we made ourselves. You can see Rachel’s HERE and mine HERE on our Instagrams! 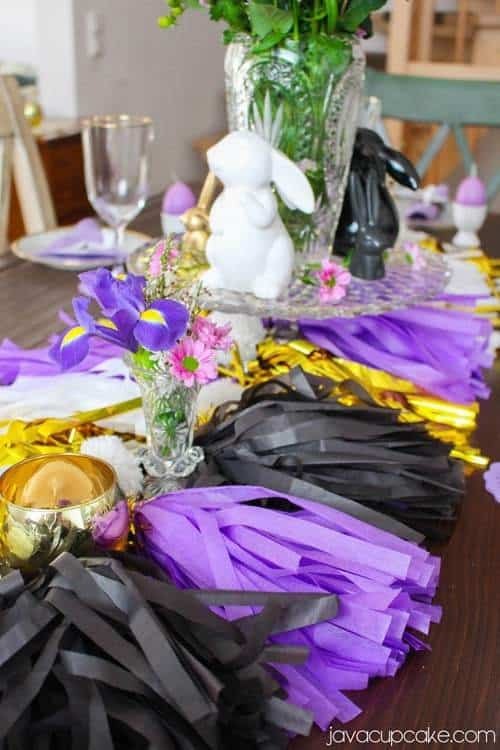 Rachel had the genius idea of creating a tissue paper tassel garland to use instead of a table runner and as a focal point on our Easter table. Being able to bring texture, color and height into the table really created a dramatic WOW factor for the table and the entire look of our brunch! Rachel has all the details on how you can recreate this look on MyDIY.life! Bunnies. Bunnies. And more Bunnies! 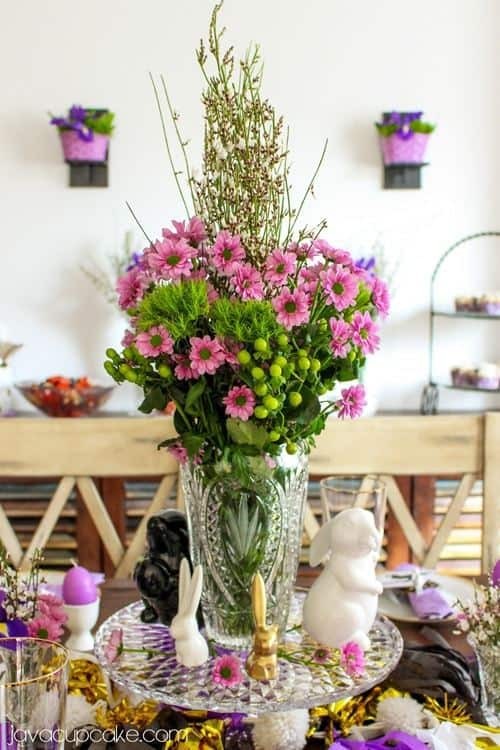 Since this was an Easter Brunch, we wanted to incorporate some kind of “cute factor” that could be carried out throughout the entire decor of the brunch. 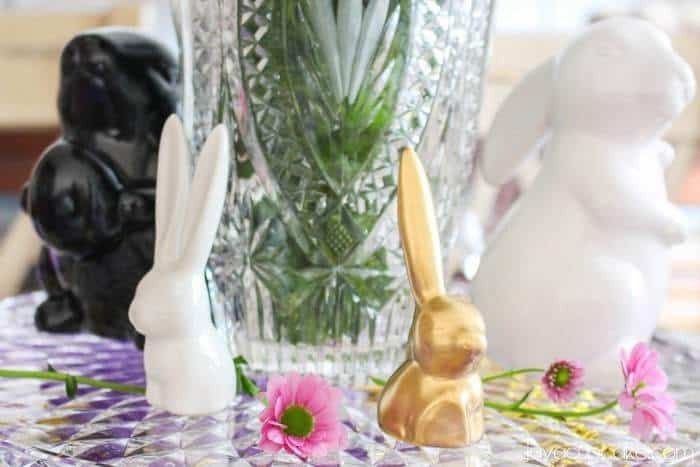 Everywhere we went, we found cute, inexpensive ceramic bunnies. Rachel painted the ones that were off color to our theme and instantly we have the cutest bunnies ever! 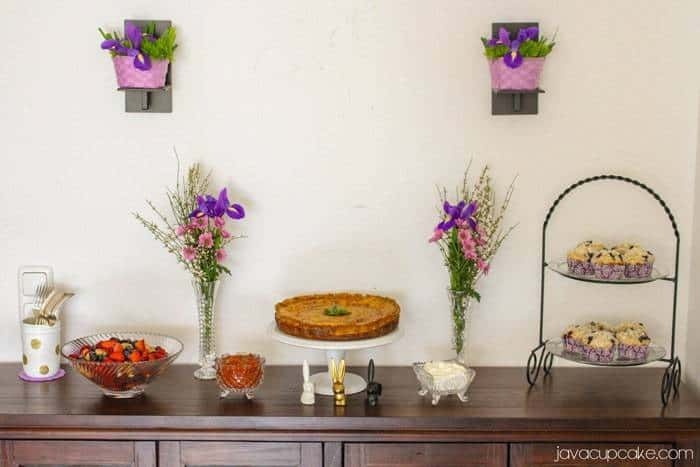 I wanted to create height and depth when displaying the food for our Easter Brunch. To do this, I used a variety of bowls in size and display stands in height. I kept them in the same texture of either glass, crystal or ceramic to create continuity. Adding the tall flowers in the skinny vases along with baskets of flowers on the candle sconces continued the floral theme to the sideboard. 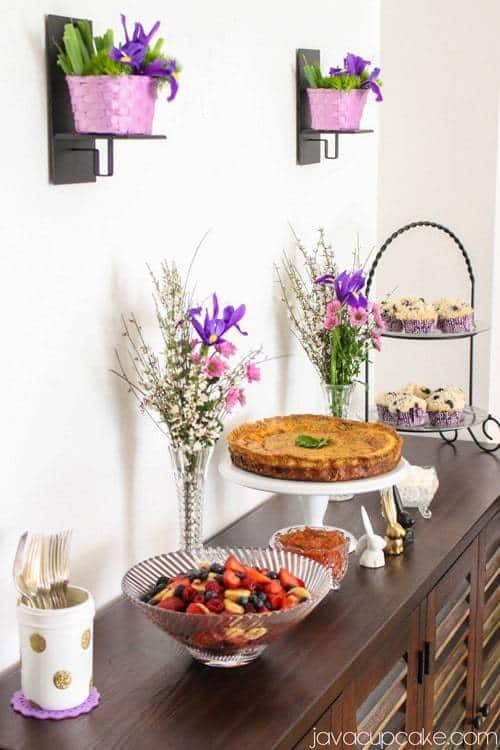 You don’t have to put sconces up on your wall, but I already had them there and it was a perfect fit for the little purple baskets we found at the Euro store. You may remember from my home office makeover that I had three mason jars made to match my office. 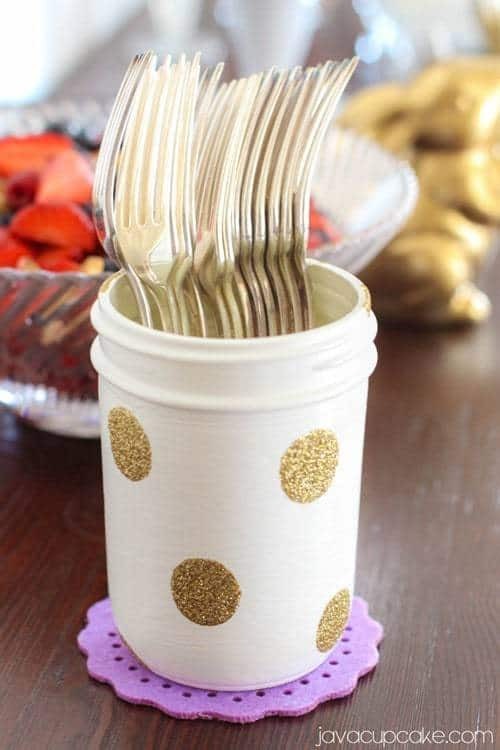 This white and gold dot jar made a perfect place to display the forks for the brunch. On the dining table and the sideboard, we were able to add another kick of lavender by using the coasters we found at the Euro store. Like with the Rice Krispie Bunny Pops, I wanted to create a special area of the display that was just for the kids! Instead of paying for brand new glass milk jars (which can be super expensive), I simply saved the Starbucks Frappuccino jars every time I bought one. Before I knew it, I had a dozen! 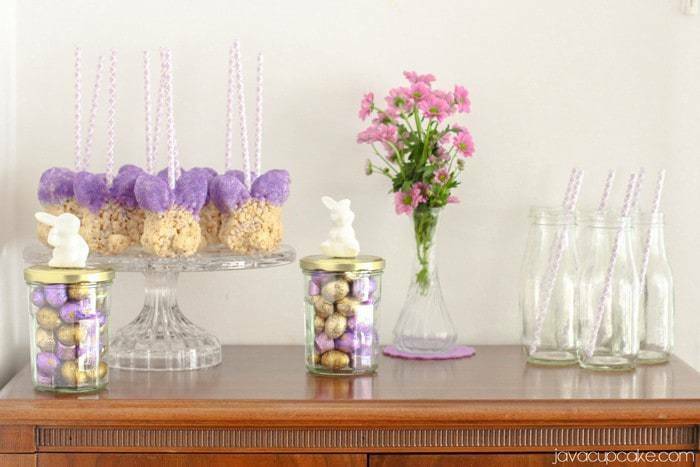 In each jar are STB paper straws that perfectly match the liners I used on the blueberry muffins and are the same straws I used for the Krispie Bunny Pops! 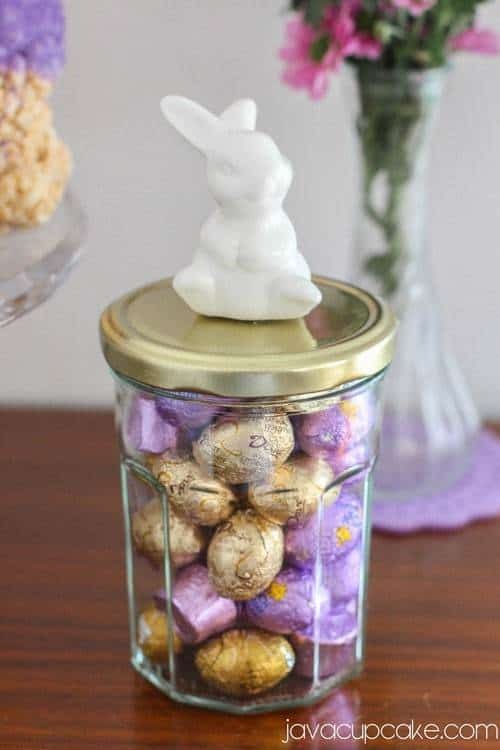 For only a few Euro, I purchased two jars with gold lids then hot glued white ceramic bunnies to the top and filled the jars with gold & lavender foil wrapped candies. I love these so much, that I think I’ll keep them out all year round with seasonal candies in them! 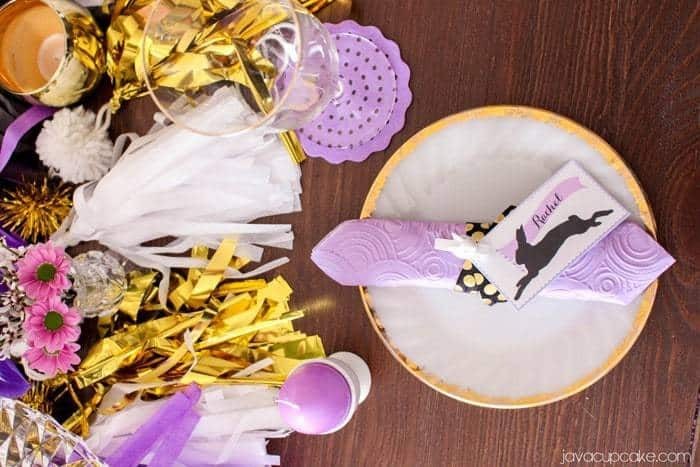 Make sure you head over to Rachel’s blog MyDIY.life for the second part in this Creating a Glam Easter Brunch and Tablescape on a Budget series! Rachel will have free printables, DIY tutorials and lots more pictures of the tablescape! Don’t worry… we’ll probably be doing the same thing!! What a gorgeous tablescape and I am drooling over all the food. Thanks Christie! It was all so delicious! These are some beautiful spring ideas! I love the Rice Krispy pops. Such a clever idea.